The republic period, with its military and political unrest, was nonetheless a golden period for the arts in China. Freed from corrupt late Qing imperial rule, scholars and artists during this period produced innovative works in literature, calligraphy, and brush painting. The best Republic porcelains are a continuation of old techniques, but are considered vastly superior to most late Qing pieces. Copies of early Qing imperial wares were in vogue at Jingdezhen, and some Republic copies are so good that experts have been baffled. This particular vase has a four-character enameled kaishu Qianlong mark (typically reserved for imperial falangcai pieces decorated in the Beijing workshops). 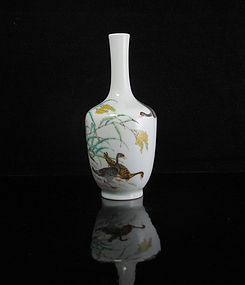 Its paste and glaze is of excellent quality; the enamels are light and clear; and the brushwork is detailed and fine. The original composition found on this vase, “geese with autumn grasses,” can be found on an imperial Qianlong screen in the collection at the Boston Museum of Fine Arts (1994.319).